As French troops hunted Islamist fighters in northern Mali this past winter, historian Greg Mann said that what was taking place in the region was not one war, but several. For a few months starting in January 2013, the various armed conflicts that had broken out over the previous year appeared to converge, as did French and Malian interests. But, as Greg reminded us in March, the French government’s war was not the Malian government’s war. 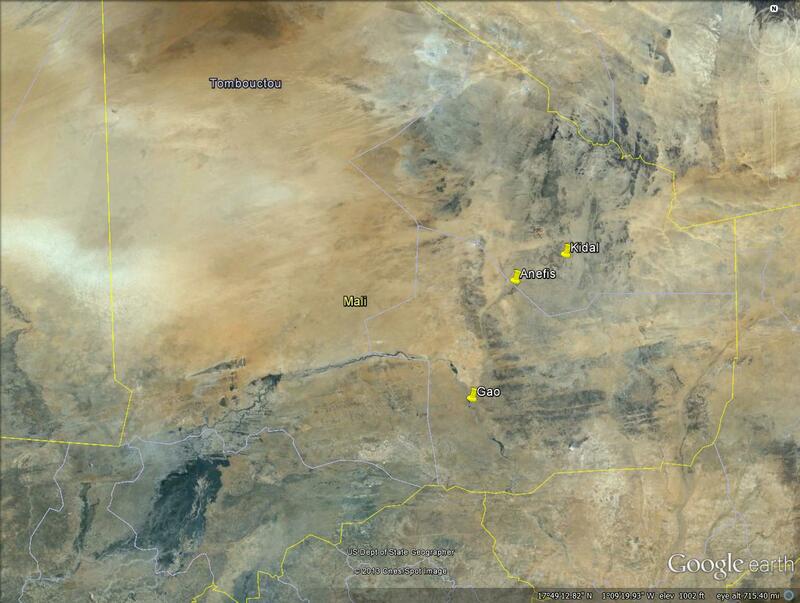 And now it seems that Mali’s war — after a long hiatus — is starting up again, and breaking away from France’s war. The rising tension has pushed defenders of each camp into their rhetorical corners. Malian government spokespeople and state media paint the MNLA as a “Tuareg supremacist” organization whose members have always refused to be ruled by blacks and instead seek to impose their racist rule on northern Mali’s diverse population. The MNLA’s most strident critics — many of whom are not southern Malians, but Songhai from the Gao region — raise the specter of light-skinned Tuareg enslaving their dark-skinned neighbors (the subject of a recent article in the Washington Post). In government-held territory, goodwill toward France has declined dramatically. In Gao, for example, youths protested last week against what they considered French complicity with the MNLA. Demonstrators also blamed the Malian government for repeatedly caving in to the demands of Tuareg rebels: “The Malian government has always favored those who take up arms over sédentaires [non-nomads] who have never taken up arms against their country,” one leader told a Malian newspaper. Some protestors said they would “prevent the holding of elections” (still scheduled for late July) until the government addresses their concerns. In Bamako, politicians have attacked President Hollande because of his less confrontational stance toward the MNLA. Cool heads are not prevailing, and the public mood is shifting away from any negotiation with the rebels. There are many questions about what comes next. Will Malian troops manage to retake Kidal? If they do, how long can they hold it? (Their supply lines will be stretched extraordinarily thinly over hundreds of miles of forbidding terrain, a problem the approaching rainy season will exacerbate.) Will the army engage in the sort of atrocities of which they have frequently been accused? What role will be played by troops from France, Chad and other African nations — whose governments sent them to fight Islamists, not take sides in a civil war? And how will the resumption of “Mali’s war” affect the nation’s electoral process? My own view is that even if it succeeds in the short term — by no means a foregone conclusion — the Malian government’s attempt to settle the conflict militarily will only aggravate the political disputes that have widened across northern Mali over the past several years. Instead of the “peace of the brave,” we are witnessing a war launched by leaders who are afraid of being perceived as weak. This entry was posted in Uncategorized and tagged army, France, Kidal, politics, Tuareg, war. Bookmark the permalink. nonsense!!! please whoever you may be learn what to write about before publishing. it’s not just writing a well-written article the goal, rather what you said in the article counts a lot. For your information, MNLA is a multi ethnic movement you want it or not! and please, please, stop your slavery game we had had enough hearing about nonsense paroles. Everyone now knows about the everlasting conflict in Mali, you don’t have to play your hypocrite allegations about it. If I were you I would have written about the atrocities that the Malian government had been and are doing to the Tuaregs regardless of the color. However, I can see that you are paid to say nasty shitttt about people just because you don’t like them. com on man, have some common sense!!! I wander if you are really telling the truth, how come you don’t see what Malian military are doing to the people? think before you write i’m sure you have heard that in school. I’m overjoyed to be hearing from my friends in the MNLA once again, it’s been far too long. Il est important que tu comprennes, Ag , que la guerre est à mener d’abord au sein des touaregs de Kidal. Il faut accorder les violons entre ceux d’Ansar Dine qui ont imposé aux touaregs la charia, ceux qui depuis Bamako detournent les fonds detestinés au developpement de la région,ceux qui desirent un Etat hypothetique qui ne viendra jamais, et la grande majorité silencieuse qui n’aspire qu’à la paix et à un coexistence pacifique avec toutes les ethnies du Mali. Faites attention à ceux qui vous induisent en erreur mais vous excluent en même temps de leur rang. Les blancs et les arabes et autres vous appellent “light-skinned people” not “white people”. Il est temps de vous enraciner quelque part. Ne vivez pas comme des sauve-chauris: ni avec les oiseaux ni avec les mammifères. J’espère que la paix et la sagesse domineront la haine dans votre coeur. Please leave us alone! We have had enough!! Your nasty propaganda is never going to harm us at all. This is an interesting and well informed piece of writing trying to present the problem from both sides. The personal comment at the end is presented as ‘my personal opinion’. So it is that one I address with my own personal opinion. You write: ‘we are witnessing a war launched by leaders who are afraid of being perceived as weak.’ I think we are witnessing a war which has the approval of the vast majority of the Malian nation, including the displaced northerners represented by COREN and including the National Assembly of Mali, the one truly democratic institution which remains here, with representatives of the entire Malian territory including Kidal. The National Assembly has voted unanimously ‘no elections before Kidal is in Malian control.’ The Malian interim government and army must act in accordance with the wishes of the Malian people. 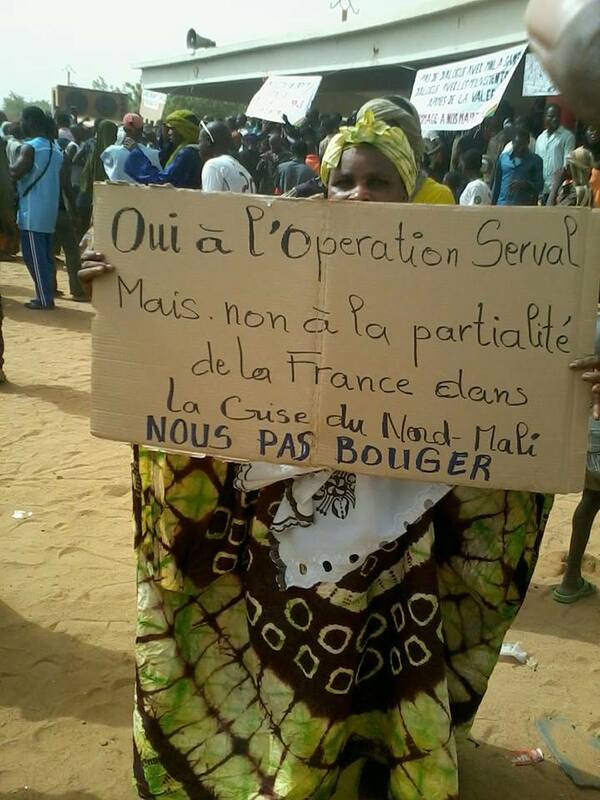 The Malian army has every right to reconquer Kidal and it is their duty to attempt to do so. I believe everything you write about this war is correct, Sophie. 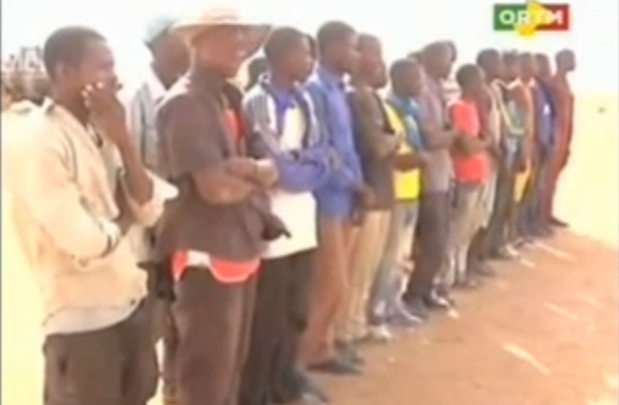 Retaking Kidal by force probably is the desire of most Malian people. But this desire is nevertheless based on a great deal of false information, and the option of force in this case is still (in my personal opinion) a bad idea, politically and morally speaking.